Alien Evolving into the Human Race? Lizards From Orion:Fact or Fiction? Nazca Lines: Airport of The Gods? Can Fractals Make Sense Of The Quantum World? Over the past several decades there has been an explosive growth in research and development related to nano materials. Among these one material, carbon Nanotubes, has led the way in terms of its fascinating structure as well as its ability to provide function-specific applications ranging from electronics, to energy and biotechnology. Carbon nanotubes (CNTs) can be viewed as carbon whiskers, which are tubules of nanometer dimensions with properties close to that of an ideal graphite fiber. Due to their distinctive structures they can be considered as matter in one-dimension (1D). In other words, a carbon nanotube is a honeycomb lattice rolled on to itself, with diameters of the order of nanometers and lengths of up to several micrometers. Generally, two distinct types of CNTs exist depending whether the tubes are made of more than one graphene sheet (multi walled carbon nanotube, MWNT) or only one graphene sheet (single walled carbon nanotube, SWNT). For a detailed description on CNTs please refer to the article by Prof. M. Endo. Irrespective of the number of walls, CNTs are envisioned as new engineering materials which possess unique physical properties suitable for a variety of applications. Such properties include large mechanical strength, exotic electrical characteristics and superb chemical and thermal stability. 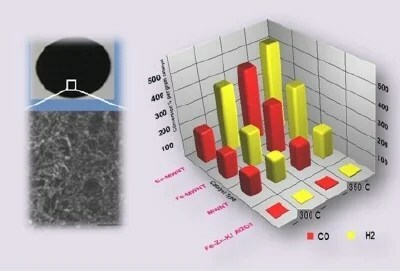 Specifically, the development of techniques for growing carbon nanotubes in a very controlled fashion (such as aligned CNT architectures on various substrates ) as well as on a large scale, presents investigators all over the world with enhanced possibilities for applying these controlled CNTs architectures to the fields of Vacuum microelectronics, Cold-cathode flat panel displays, Field emission devices, Vertical interconnect assemblies, Gas breakdown sensors, Bio Filtration, On chip thermal management, etc. Apart from their outstanding structural integrity as well as chemical stability, the property that makes carbon nanotubes truly multifunctional in nature is the fact that carbon nanotubes have lot to offer (literally) in terms of specific surface area. Depending on the type of CNTs the specific surface areas may range from 50 m2/gm to several hundreds of m2/gm and with appropriate purification processes the specific surface areas can be increased up to ~1000 m2/gm. Extensive theoretical and experimental studies have shown that the presence of large specific surface areas is accompanied by the availability of different adsorption sites on the nanotubes. For example, In CNTs produced using catalyst assisted chemical vapor deposition the adsorption occurs only on the outer surface of the curved cylindrical wall of the CNTs. 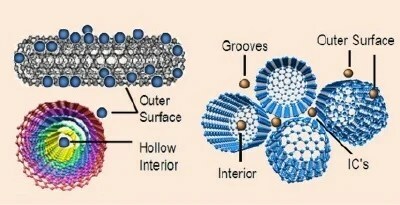 This is because the production process of the CNTs using metal catalysts usually leads to nanotubes with closed ends, thereby restricting the access of the hollow interior space of the tube. However, there are simple procedures (mild chemical or thermal treatments) which can remove the end caps of the MWNTs thereby presenting the possibility of another adsorption site (inside the tube) in MWNTs as schematically shown in Figure 1. Similarly, the large scale production process of SWNTs lead to the bundling of the SWNTs. Due to this bundling effect, SWNT bundles provide various high energy binding sites (for example grooves, Figure 1.). What this means is then that large surfaces are available in small volume and these surfaces can interact with other species or can be tailored and functionalized. Figure 1: Possible binding sites available for adsorption on (left) MWNTs and (right) SWNTs surfaces. Electrochemical Double Layer Capacitors (EDLC’s: Also referred to as Super Capacitors and Ultra-Capacitors) are envisioned as devices that will have the capability of providing high energy density as well as high power density. With extremely high life-span and charge-discharge cycle capabilities EDLC’s are finding versatile applications in the military, space, transportation, telecommunications and nanoelectronics industries. An EDLC contains two non reactive porous plates (electrodes or collectors with extremely high specific surface area), separated by a porous membrane and immersed in an electrolyte. Various studies have shown the suitability of CNTs as EDLC electrodes. 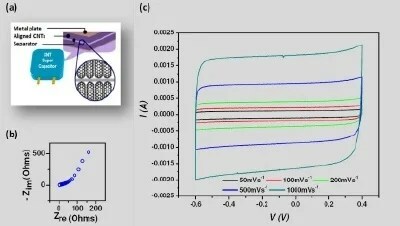 However, proper integration of CNTs with collector electrodes in EDLCs are needed for minimizing the overall device resistance in order to enhance the performance of CNT based supercapacitors. A strategy for achieving this could be growing CNTs directly on metal surfaces and using them as EDLC electrodes (Figure 2). EDLC electrodes with very low equivalent series resistance (ESR) and high power densities can be obtained by using such approaches. Figure 2: (a) Artist rendition of EDLC formed by aligned MWNT grown directly on metals (b) An electrochemical impedance spectroscopy plot showing low ESR of such EDLC devices and (c) very symmetric and near rectangular cyclic voltamograms of such devices indicating impressive capacitance behavior. Catalysts play an important role in our existence today. Catalysts are small particles (~ 10-9 meter, or nanometer) which due to their unique surface properties can enhance important chemical reactions leading to useful products. In any kind of catalytic process, the catalysts are dispersed on high surface area materials, known as the catalyst support. The support provides mechanical strength to the catalysts in addition to enhance the specific catalytic surface and enhancing the reaction rates. CNTs, due to their high specific surface areas, outstanding mechanical as well as thermal properties and chemically stability can potentially become the material of choice for catalyst support in a variety of catalyzed chemical reactions. We are presently exploring the idea of using CNTs as catalyst support in the Fischer Tropsch (FT) synthesis process. The FT reaction can convert a mixture of carbon monoxide and hydrogen in to a wide range of straight chained and branched olefins and paraffins and oxygenates (leading to the production of high quality synthetic fuels). Our preliminary FT synthesis experiments on CNT supported FT catalysts (generally cobalt and iron) shows that the conversion of CO and H2 obtained with FT catalyst loaded CNTs is orders of magnitude higher than that obtained with conventional FT catalysts (Figure 3), indicating that CNTs offer a new breed of non-oxide based catalyst supports with superior performance for FT synthesis. So far, CNT research has provided substantial excitement, and novel possibilities in developing applications based on interdisciplinary nanotechnology. The area of large scale growth of CNTs is quiet mature now and hence it could be expected that several solid large volume applications will emerge in the near future. A while back , I’ve published an article about explaining need to colonize mars. Last year, NASA successfully developed “alternative crops” that can be grown in space like (zero gravity) conditions. Plants are fundamental to life on Earth, converting light and carbon dioxide into food and oxygen. Plant growth may be an important part of human survival in exploring space, as well. Gardening in space has been part of the International Space Station from the beginning — whether peas grown in the Lada greenhouse or experiments in the Biomass Production System. The space station offers unique opportunities to study plant growth and gravity, something that cannot be done on Earth. The latest experiment that has astronauts putting their green thumbs to the test is Hydrotropism and Auxin-Inducible Gene expression in Roots Grown Under Microgravity Conditions, known as HydroTropi. Operations were conducted October 18-21, 2010, HydroTropi is a Japan Aerospace Exploration Agency (JAXA)-run study that looks at directional root growth. In microgravity, roots grow latterly or sideways, instead of up and down like they do under Earth’s gravitational forces. Hydrotropism and Auxin-Inducible Gene expression in Roots Grown Under Microgravity Conditions (HydroTropi) determines whether hydrotropic response can be used for the control of cucumber, Cucumis sativus root growth orientation in microgravity. First, it demonstrates that gravitropism (a plant’s ability to change its direction of growth in response to gravity) interferes with hydrotropism (a directional growth response in which the direction is determined by a stimuli in water concentration). Second, it clarifies the differential auxin response that occurs during the respective tropisms (reaction of a plant to a stimulus), by investigating the auxin (compound regulating the growth of plants) inducible gene expression. Third, it shows whether hydrotropism can be used in controlling root growth orientation in microgravity. Using cucumber plants (scientific name Cucumis sativus), investigators look to determine whether hydrotropic — plant root orientation due to water—response can control the direction of root growth in microgravity. To perform the HydroTropi experiment, astronauts transport the cucumber seeds from Earth to the space station and then coax them into growth. The seeds, which reside in Hydrotropism chambers, undergo 18 hours of incubation in a Cell Biology Experiment Facility orCBEF. Then the crewmembers activate the seeds with water or a saturated salt solution, followed by a second application of water 4 to 5 hours later. The crew harvests the cucumber seedlings and preserves them using fixation tubes called Kenney Space Center Fixation Tubes or KFTs, which then store in one of the station MELFI freezers to await return to Earth. 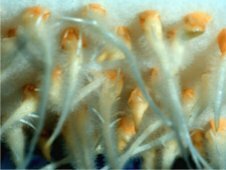 The results from HydroTropi, which returns to Earth on STS-133, will help investigators to better understand how plants grow and develop at a molecular level. The experiment will demonstrate a plant’s ability to change growth direction in response to gravity (gravitropism) vs. directional growth in response to water (hydrotropism). By looking at the reaction of the plants to the stimuli and the resulting response of differential auxin — the compound regulating the growth of plants — investigators will learn about plants inducible gene expression. In space, investigators hope HydroTropi will show them how to control directional root growth by using the hydrotropism stimulus; this knowledge may also lead to significant advancements in agriculture production on Earth. Science fiction lovers aren’t the only ones captivated by the possibility of colonizing another planet. Scientists are engaging in numerous research projects that focus on determining how habitable other planets are for life. Mars, for example, is revealing more and more evidence that it probably once had liquid water on its surface, and could one day become a home away from home for humans. Humans traveling to Mars, to visit or to colonize, will likely have to make use of resources on the planet rather than take everything they need with them on a spaceship. This means farming their own food on a planet that has a very different ecosystem than Earth’s. Certini and his colleague Riccardo Scalenghe from the University of Palermo, Italy, recently published a study in Planetary and Space Science that makes some encouraging claims. They say the surfaces of Venus, Mars and the Moon appear suitable for agriculture. Before deciding how planetary soils could be used, the two scientists had to first explore whether the surfaces of the planetary bodies can be defined as true soil. One of the first obstacles in examining planetary surfaces and their usefulness in space exploration is to develop a definition of soil, which has been a topic of much debate. “The lack of a unique definition of ‘soil,’ universally accepted, exhaustive, and (one) that clearly states what is the boundary between soil and non-soil makes it difficult to decide what variables must be taken into account for determining if extraterrestrial surfaces are actually soils,” Certini said. On Earth, five factors work together in the formation of soil: the parent rock, climate, topography, time and biota (or the organisms in a region such as its flora and fauna). It is this last factor that is still a subject of debate among scientists. A common, summarized definition for soil is a medium that enables plant growth. However, that definition implies that soil can only exist in the presence of biota. Certini argues that soil is material that holds information about its environmental history, and that the presence of life is not a necessity. The researchers of this study contend that classifying a material as soil depends primarily on weathering. According to them, a soil is any weathered veneer of a planetary surface that retains information about its climatic and geochemical history. On Venus, Mars and the Moon, weathering occurs in different ways. Venus has a dense atmosphere at a pressure that is 91 times the pressure found at sea level on Earth and composed mainly of carbon dioxide and sulphuric acid droplets with some small amounts of water and oxygen. The researchers predict that weathering on Venus could be caused by thermal process or corrosion carried out by the atmosphere, volcanic eruptions, impacts of large meteorites and wind erosion. Mars is currently dominated by physical weathering caused by meteorite impacts and thermal variations rather than chemical processes. According to Certini, there is no active volcanism that affects the martian surface but the temperature difference between the two hemispheres causes strong winds. Certini also said that the reddish hue of the planet’s landscape, which is a result of rusting iron minerals, is indicative of chemical weathering in the past. On the Moon, a layer of solid rock is covered by a layer of loose debris. The weathering processes seen on the Moon include changes created by meteorite impacts, deposition and chemical interactions caused by solar wind, which interacts with the surface directly. Some scientists, however, feel that weathering alone isn’t enough and that the presence of life is an intrinsic part of any soil. “The living component of soil is part of its unalienable nature, as is its ability to sustain plant life due to a combination of two major components: soil organic matter and plant nutrients,” said Ellen Graber, researcher at the Institute of Soil, Water and Environmental Sciences at The Volcani Center of Israel’s Agricultural Research Organization. One of the primary uses of soil on another planet would be to use it for agriculture—to grow food and sustain any populations that may one day live on that planet. Some scientists, however, are questioning whether soil is really a necessary condition for space farming. Growing plants without any soil may conjure up images from a Star Trek movie, but it’s hardly science fiction. Aeroponics, as one soilless cultivation process is called, grows plants in an air or mist environment with no soil and very little water. Scientists have been experimenting with the method since the early 1940s, and aeroponics systems have been in use on a commercial basis since 1983. In 1997, NASA teamed up with AgriHouse and BioServe Space Technologies to design an experiment to test a soilless plant-growth system on board the Mir Space Station. NASA was particularly interested in this technology because of its low water requirement. Using this method to grow plants in space would reduce the amount of water that needs to be carried during a flight, which in turn decreases the payload. Aeroponically-grown crops also can be a source of oxygen and drinking water for space crews. “I would suspect that if and when humankind reaches the stage of settling another planet or the Moon, the techniques for establishing soilless culture there will be well advanced,” Graber predicted. The surface and soil of a planetary body holds important clues about its habitability, both in its past and in its future. For example, examining soil features have helped scientists show that early Mars was probably wetter and warmer than it is currently. “Studying soils on our celestial neighbors means to individuate the sequence of environmental conditions that imposed the present characteristics to soils, thus helping reconstruct the general history of those bodies,” Certini said. In 2008, NASA’s Phoenix Mars Lander performed the first wet chemistry experiment using martian soil. Scientists who analyzed the data said the Red Planet appears to have environments more appropriate for sustaining life than was expected, environments that could one day allow human visitors to grow crops. Researchers found traces of magnesium, sodium, potassium and chloride, and the data also revealed that the soil was alkaline, a finding that challenged a popular belief that the martian surface was acidic. This type of information, obtained through soil analyses, becomes important in looking toward the future to determine which planet would be the best candidate for sustaining human colonies. The video game Tetris may quell flashbacks of traumatic events in a way that other kinds of games can’t, researchers have found. The curious effect might have to do with how the shapes in the game compete with images of a traumatic scene when it comes to getting stored in one’s memory. Tetris, one of themost popular video games of all time, involves moving and rotating shapes falling down a a playing field with the aim of creating horizontal lines of blocks without gaps. In earlier work, scientists at Oxford University in England found that playing Tetris after traumatic events could reduce flashbacks in healthy volunteers. The hope of this research is to reduce the painful memories linked with post-traumatic stress disorder(PTSD). Our latest findings suggest Tetris is still effective as long as itis played within a four-hour window after viewing a stressful film. Whilst playing Tetris can reduce flashback-type memories without wiping out the ability to make sense of the event, we have shown that not all computer games have this beneficial effect — some may even have a detrimental effect on how people deal with traumatic memories. To explain these unusual results, think of the mind as having two separate channels of thought. One is sensory, dealing with perceptions of the world as experienced through sight, sound, smell, taste and touch, while the other is conceptual, responsible for combining sensory details in a meaningful way. These channels generally work in harmony with each other — for instance, we might see and hear someone talk and quickly comprehend what that person is saying. However, after traumatic events, the sensory channel is thought to overwhelm the conceptual one. As such, we are less likely to, for example, remember a high-speed traffic accident as a story than as a flash of headlights and the noise of a crash. These sensory details then intrude repeatedly in a victim’s mind in the form of flashbacks, often causing great distress. Past research suggested there is a timeframe of up to six hours after a trauma in which one can interfere with the way traumatic memories are formed in the mind. During this window of opportunity, certain tasks can compete with the same mental channels needed to form those memories, in much the same way it can prove hard to hold a conversation while solving a math problem. As such, the Oxford team focused on Tetris, a task that demands visual attention and visual memory. They suggest the game achieves its beneficial effects regarding flashbacks by competing with traumatic detailson the sensory channel. On the other hand, Pub Quiz might compete with the conceptual channel, reinforcing sensory details of traumatic events. These laboratory experiments can help us understand how unwanted flashback memories may be formed. This can help us better understand this fundamental aspect of human memory. It may also lead us to think about new ways to develop preventative treatments after trauma. However, she cautioned that thisis early stage laboratory research, and that further work is needed to move this into clinical situations. Telepathy is probably, I think, most alluring and widely spread concept and often portrayed by our sci fi media which sometimes sail concepts into abyss of highly impertinent imagination. Well, natural telepathy may not be possible for all but artificial telepathy would bring this capability to you. You will be able to communicate through your brain by this amazing technology of artificial telepathy network-Wireless Sensor Network. This future Wireless Sensor Network (WSN) based communication technology direction relates to a system and method for enabling human beings to communicate with one another by monitoring brain activity. In particular, this relates to such a system and method where brain activity of a particular individual is monitored and transmitted in a wireless manner (e.g. via satellite)from the location of the individual to a remote location so that the brain activity can be computer analyzed at the remote location there by enabling the computer and/or individuals at the remote location to determine what the monitored individual was thinking or wishing to communicate. In certain embodiments this future WSN based communication technology direction would relate to the analysis of brain waves or brain activity, and/or to the remote firing of select brain nodes in order to produce a predetermined effect on an individual. – determining whether the first human being was attempting to communicate particular words, phrases or thoughts, based upon the comparing of the received brain activity information to the information from memory. -asking the first human being a plurality of questions and recording brain activity of the first human being responsive to the plurality of questions in the process of developing said normalized or averaged brain activity information relating to the first human being stored in the memory. -A database in a memory may include, for each of a plurality (e.g. one hundred or thousands) of individuals, a number of prerecorded files each corresponding to a particular thought, attempt to communicate a word, attempt to attempt to communicate a phrase or thought, or mental state. -Measured brain activity of a given individual may be compared to files from that database of that individual to determine what the individual is attempting to communicate or what type of mental state the individual is in. It is another object of this future WSN based communication technology direction to communicate monitored brain activity from one location to another in a wireless manner, such as by IR, RF, or satellite. In certain terms of this WSN based future communication technology direction, the computer located at the remote location includes a neural network suitably programmed in accordance with known neural network techniques, for the purpose of receiving the monitored brain activity signals, transforming the signals into useful forms, training and testing the neural network to distinguish particular forms and patterns of physiological activity generated in the brain of the monitored individual, and/or comparing the received monitored brain activity information with stored information. A small asteroid will fly past Earth early Tuesday within the Earth-moon system. The asteroid, 2010 TD54, will have its closest approach to Earth’s surface at an altitude of about 45,000 kilometers (27,960 miles) at 6:50 EDT a.m. (3:50 a.m. PDT). At that time, the asteroid will be over southeastern Asia in the vicinity of Singapore. During its flyby, Asteroid 2010 TD54 has zero probability of impacting Earth. A telescope of the NASA-sponsored Catalina Sky Survey north of Tucson, Arizona discovered 2010 TD54 on Oct. 9 at (12:55 a.m. PDT) during routine monitoring of the skies. 2010 TD54 is estimated to be about 5 to 10 meters (16 to 33 feet) wide. Due to its small size, the asteroid would require a telescope of moderate size to be viewed. A five-meter-sized near-Earth asteroid from the undiscovered population of about 30 million would be expected to pass daily within a lunar distance, and one might strike Earth’s atmosphere about every 2 years on average. If an asteroid of the size of 2010 TD54 were to enter Earth’s atmosphere, it would be expected to burn up high in the atmosphere and cause no damage to Earth’s surface. The distance used on the Near Earth Object page is always the calculated distance from the center of Earth. The distance stated for 2010 TD54 is 52,000 kilometers (32,000 miles). To get the distance it will pass from Earth’s surface you need to subtract the distance from the center to the surface (which varies over the planet), or about one Earth radii. That puts the pass distance at about 45,500 kilometers (28,000 miles) above the planet. NASA detects, tracks and characterizes asteroids and comets passing close to Earth using both ground- and space-based telescopes. The Near-Earth Object Observations Program, commonly called “Spaceguard,” discovers these objects, characterizes a subset of them, and plots their orbits to determine if any could be potentially hazardous to our planet. NASA’s Marshall Space Flight Center in Huntsville, Ala., collaborated with NASA’s White Sands Test Facility in Las Cruces, N.M., and Pratt & Whitney Rocketdyne in Canoga Park, Calif., to successfully complete a series of thruster tests at the White Sands test facility. The test will aid in maneuvering and landing the next generation of robotic lunar landers that could be used to explore the moon’s surface and other airless celestial bodies. The Robotic Lunar Lander Development Project at the Marshall Center performed a series of hot-fire tests on two high thrust-to-weight thrusters – a 100-pound-class for lunar descent and a 5-pound-class for attitude control. The team used a lunar mission profile during the test of the miniaturized thrusters to assess the capability of these thruster technologies for possible use on future NASA spacecraft. The test program fully accomplished its objectives, including evaluation of combustion stability, engine efficiency, and the ability of the thruster to perform the mission profile and a long-duration, steady-state burn at full power. The test results will allow the Robotic Lander Project to move forward with robotic lander designs using advanced propulsion technology. The test articles are part of the Divert Attitude Control System, or DACS, developed by the U.S. Missile Defense Agency of the Department of Defense. The control system provides two kinds of propulsion — one for control and the other for maneuvering. The Attitude Control System thrusters provide roll, pitch and yaw control. These small thruster types were chosen to meet the golf-cart-size lander’s requirement for light-weight, compact propulsion components to aid in reducing overall spacecraft mass and mission cost by leveraging an existing government resource. The Missile Defense Agency heritage thrusters were originally used for short-duration flights and had not been qualified for space missions, so our engineers tested them to assess their capability for long-duration burns and to evaluate their performance and combustion behavior. The thrusters are a first step in reducing propulsion technology risks for a lander mission. The results will be instrumental in developing future plans associated with the lander’s propulsion system design. During tests of the 100-pound thruster, the Divert Attitude Control System thruster fired under vacuum conditions to simulate operation in a space environment. The tests mimicked the lander mission profile and operation scenarios. The test included several trajectory correction maneuvers during the cruise phase; nutation control burns to maintain spacecraft orientation; thruster vector correction during the solid motor braking burn; and a terminal descent burn on approach to the lunar surface. The objective for the five -pound-class thruster test was similar to the 100-pound thruster test with an additional emphasis on the thruster heating assessment due to the long-duration mission profile and operation with MMH/MON-25 — monomethylhydrazine (MMH) fuel and a nitrogen tetroxide (75 percent)/nitrogen oxide (25 percent) (MON-25) oxidizer. A standard propellant system for spacecraft is the MMH/MON-3 propellant system — containing 3 percent nitric oxide. An alternate propellant system, MMH/MON-25, contains 25 percent nitric oxide. With its chemical composition, it has a much lower freezing point than MON-3, making it an attractive alternative for spacecraft with its thermal benefits and resulting savings in heater power. Because the MMH/MON-25 propellant system has never been used in space, these tests allowed engineers to benchmark the test against the MMH/MON-3 propellant system. The lower freezing point could save considerable heater power for the spacecraft and increase thermal margin for the entire propulsion system. These tests showed stable combustion in all scenarios and favorable temperature results. The Red Planet bleeds. Not blood, but its atmosphere, slowly trickling away to space. The culprit is our sun, which is using its own breath, the solar wind, and its radiation to rob Mars of its air. The crime may have condemned the planet’s surface, once apparently promising for life, to a cold and sterile existence. Features on Mars resembling dry riverbeds, and the discovery of minerals that form in the presence of water, indicate that Mars once had a thicker atmosphere and was warm enough for liquid water to flow on the surface. However, somehow that thick atmosphere got lost in space. It appears Mars has been cold and dry for billions of years, with an atmosphere so thin, any liquid water on the surface quickly boils away while the sun’s ultraviolet radiation scours the ground. Such harsh conditions are the end of the road for known forms of life. Although it’s possible that martian life went underground, where liquid water may still exist and radiation can’t reach. The lead suspect for the theft is the sun, and its favorite M.O. may be the solar wind. All planets in our solar system are constantly blasted by the solar wind, a thin stream of electrically charged gas that continuously blows from the sun’s surface into space. On Earth, our planet’s global magnetic field shields our atmosphere by diverting most of the solar wind around it. The solar wind’s electrically charged particles, ions and electrons, have difficulty crossing magnetic fields. Mars can’t protect itself from the solar wind because it no longer has a shield, the planet’s global magnetic field is dead. Mars lost its global magnetic field in its youth billions of years ago. Once its planet-wide magnetic field disappeared, Mars’ atmosphere was exposed to the solar wind and most of it could have been gradually stripped away. “Fossil” magnetic fields remaining in ancient surfaces and other local areas on Mars don’t provide enough coverage to shield much of the atmosphere from the solar wind. Although the solar wind might be the primary method, like an accomplished burglar, the sun’s emissions can steal the martian atmosphere in many ways. However, most follow a basic M.O., the solar wind and the sun’s ultraviolet radiation turns the uncharged atoms and molecules in Mars’ upper atmosphere into electrically charged particles (ions). Once electrically charged, electric fields generated by the solar wind carry them away. The electric field is produced by the motion of the charged, electrically conducting solar wind across the interplanetary, solar-produced magnetic field, the same dynamic generators use to produce electrical power. An exception to this dominant M.O. are atoms and molecules that have enough speed from solar heating to simply run away, they remain electrically neutral, but become hot enough to escape Mars’ gravity. Also, solar extreme ultraviolet radiation can be absorbed by molecules, breaking them into their constituent atoms and giving each atom enough energy that it might be able to escape from the planet. There are other suspects. Mars has more than 20 ancient craters larger than 600 miles across, scars from giant impacts by asteroids the size of small moons. This bombardment could have blasted large amounts of the martian atmosphere into space. However, huge martian volcanoes that erupted after the impacts, like Olympus Mons, could have replenished the martian atmosphere by venting massive amounts of gas from the planet’s interior. It’s possible that the hijacked martian air was an organized crime, with both impacts and the solar wind contributing. Without the protection of its magnetic shield, any replacement martian atmosphere that may have issued from volcanic eruptions eventually would also have been stripped away by the solar wind. Earlier Mars spacecraft missions have caught glimpses of the heist. For example, flows of ions from Mars’ upper atmosphere have been seen by both NASA’s Mars Global Surveyor and the European Space Agency’s Mars Express spacecraft. Previous observations gave us ‘proof of the crime’ but only provided tantalizing hints at how the sun pulls it off — the various ways Mars can lose its atmosphere to solar activity,” said Joseph Grebowsky of NASA’s Goddard Space Flight Center in Greenbelt, Md. “MAVEN will examine all known ways the sun is currently swiping the Martian atmosphere, and may discover new ones as well. It will also watch how the loss changes as solar activity changes over a year. Linking different loss rates to changes in solar activity will let us go back in time to estimate how quickly solar activity eroded the Martian atmosphere as the sun evolved. As the martian atmosphere thinned, the planet got drier as well, because water vapor in the atmosphere was also lost to space, and because any remaining water froze out as the temperatures dropped when the atmosphere disappeared. MAVEN can discover how much water has been lost to space by measuring hydrogen isotope ratios. Isotopes are heavier versions of an element. For example, deuterium is a heavy version of hydrogen. Normally, two atoms of hydrogen join to an oxygen atom to make a water molecule, but sometimes the heavy and rare, deuterium takes a hydrogen atom’s place. On Mars, hydrogen escapes faster because it is lighter than deuterium. Since the lighter version escapes more often, over time, the martian atmosphere has less and less hydrogen compared to the amount of deuterium remaining. The martian atmosphere therefore becomes richer and richer in deuterium. The MAVEN team will measure the amount of hydrogen compared to the amount of deuterium in Mars’ upper atmosphere, which is the planet’s present-day hydrogen to deuterium (H/D) ratio. They will compare it to the ratio Mars had when it was young — the original H/D ratio. The original ratio is estimated from observations of the H/D ratio in comets and asteroids, which are believed to be pristine, “fossil” remnants of our solar system’s formation. Comparing the present and original H/D ratios will allow the team to calculate how much hydrogen, and therefore water, has been lost over Mars’ lifetime. For example, if the team discovers the martian atmosphere is ten times richer in deuterium today, the planet’s original quantity of water must have been at least ten times greater than that seen today. MAVEN will also help determine how much martian atmosphere has been lost over time by measuring the isotope ratios of other elements in the air, such as nitrogen, oxygen, and carbon. MAVEN is scheduled for launch between November 18 and December 7, 2013. If it is launched November 18, it will arrive at Mars on September 16, 2014 for its year-long mission. The Mars Atmosphere and Volatile EvolutioN (MAVEN) mission, scheduled for launch in late 2013, will be the first mission devoted to understanding the Martian upper atmosphere. The goal of MAVEN is to determine the role that loss of atmospheric gas to space played in changing the Martian climate through time. Where did the atmosphere – and the water – go? MAVEN will determine how much of the Martian atmosphere has been lost over time by measuring the current rate of escape to space and gathering enough information about the relevant processes to allow extrapolation backward in time. Why Has There Been No Contact With Aliens? What’s Wrong with NASA: Evidences of Life on Saturn’s Moon Enceladus? Ancient Atlantis or Something Else? Rogue Planets Could Harbour Life! Is Time Travel Possible? Why Time Travel Is Possible? Why Colonization Of Galaxy Is Improbable With Self Replicating Probes?